Grilled peri peri chicken and fries with rice was lunch yesterday as I was craving for it for so long. 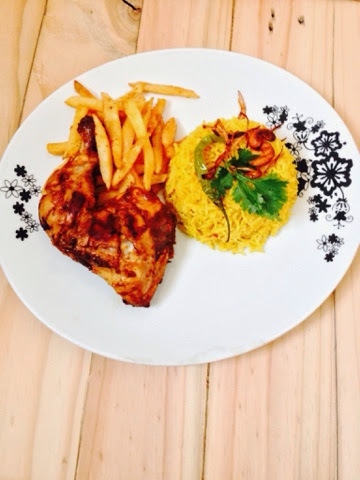 I know everybody have their own recipe for peri peri chicken, here is how I made mine. Prick chicken pieces well, marinate chicken with soy sauce, black pepper, garlic paste, Wooster sauce, oil, lemon juice, paprika, peri peri sauce and meat tenderiser for 2 hrs. Grill chicken pieces in pre heated oven for 20 mins. Remove in frying pan and fry for 10 mins until golden. Place on serving platter and serve with peri peri fries and rice. Soak rice for 1/2 n hour, in a cooking pot take oil, add cumin and fry till it crackles add onion, add black pepper, cloves, cinnamon, bay leaf fry Untill onion becomes light brown. Add tomatoes, turmeric , salt and cook further for 5 mins, when masala leaves oil on sides add water add rice and cook on high flame. The tip here is after adding rice water should be 1 inch above rice in pot. Cook for 10 to 15 mins. Now take a flat pan and keep the pot on it and on low flame keep the rice on dum for 5 mins. Serve garnished with your choice of nuts. Cut potatoes in thick juliennes and boil for 5 mins. Dry the potatoes on kitchen towel coat in corn flour and deep fry it till golden brown. Drain on kitchen towel. Add salt, blackpepper and peri peri sauce. Serve with chicken and rice. An amateur 28 yr old cook, with passion for cooking and all things artistic, striving for perfection.